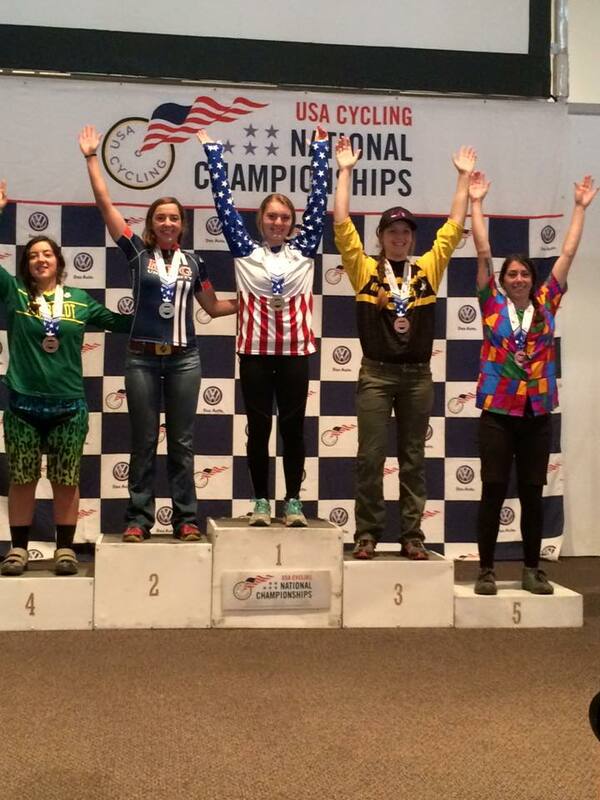 Josie Ritchie National Champion DII Dual Slalom, Team grabs 7th!! The team of Josie Ritchie, Alex Christofalos, Nathan Hake and Hunter Resek represented Mars Hill University at the USA Cycling Collegiate National Championships. Day one kicked off with both the men’s and women’s short track racing. The men hit the very quick half pavement half single track loop first with Hunter Resek leading the charge into turn one. Hunter was able to make the early selection of 7 while Nathan put on the massive battle working his way up after a mid-pack start. When it was all said and done Hunter held on for 7th with Nathan having a strong first appearance finish in 23rd. Alex was up next, with a bit of a bobble off the start caused by another rider she had her work cut out for herself and fought every second crawling her way back up inside the top ten and finished 8th on the day. Day two led to the men’s and women’s cross country racing. The challenging loop was sure to prove that the strongest would win. Like day one the men raced first with Hunter and Nathan both having great starts and rode smart and tough for 9th (Hunter) and 29th (Nathan) The women’s race started shortly after and strung out almost from the gun making it a mental game to keep pushing for any and all places up the trail. Alex showed her power and held on to round out the top ten in 10th place. Day three would wrap up the contest with the team relay and the dual slalom events. First up was the team relay consisting on Hunter (lap 1), Alex (lap 2 and 4), Nathan (lap 3). Hunter helped the team with a great start and came into the first exchange with the top 5 teams. Alex blasted her first lap keeping the team within striking distance. Nathan found fresh legs out there on lap 3 and passed every team but King in first to send Alex out for the last lap sitting in second. With it being her second lap of the race she felt the first effort and rode her heart out to hold on for 4th place. With a great team result in the relay the team was pumped to cheer on Josie in the final event of the weekend in the dual slalom. With rain overnight the ground was left wet but that didn’t stop Josie. After qualifications she was ranked #1 and in the heat runs that afternoon she proved why. She won every single run from start to finish all the way into the finals. In the finals she was up against Kaysee Armstrong of King University. The first run of differential (meaning time gaps are based on how much time is between 1st and 2nd once the 1st rider crosses the finish line) Josie went up 1.15sec’s over Kaysee after run one, run two went to Kaysee by half a bike length and since she didn’t beat Josie by over the 1.15sec she was down Josie won the National Title. After the 3 days of competition the team held on to 7th in the team omnium. The team showed great sportsmanship and teamwork battling schools with more numbers and still racing and placing both individually and team wise at a national level and with yet another National Champion! Next Up cyclo-cross, please stay tuned for more updates and a new “inside collegiate cycling” segments written by Mars Hill University cyclist. Follow us on facebook and instagram @marshillcycling.